Triple Cheltenham Gold Cup winner Best Mate has collapsed and died after his run in Tuesday's William Hill Haldon Gold Cup at Exeter. The much-loved horse, trained by Henrietta Knight seemed to be in some distress after being pulled up by jockey Paul Carberry. 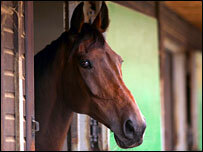 But as he was being brought back to the course stables, he collapsed with a suspected heart attack and died. "He died doing what he enjoyed doing - and that was racing," said Knight. Best Mate, who won the 2002, 2003 and 2004 Cheltenham Gold Cups had been ruled out of the 2005 race after suffering a burst blood vessel and the Exeter race marked his return to the track. Under the guidance of Carberry for the first time after the retirement of Jim Culloty, he had been well-placed behind leader Ashley Brook early on. But Carberry started to nudge the Jim Lewis-owned 10-year-old on as the leaders moved clear, and he pulled the horse up. The race was won by 10-1 chance Monkerhostin. Trainer Henrietta Knight was quickly on the scene after the horse collapsed. "I was actually on the track where he came down and I was the first one there. I knew immediately he had died," she said. "As I saw him go down I knew I was seeing a dead horse and I just wanted it to be over as quickly as possible. "I have ridden a horse before who suffered a heart attack while I was on board and I have to say this looks reminiscent of that. The legs go, they wobble and then they go down. "It hasn't sunk in yet but I am honoured to have had a wonderful horse like him to train and he really put my yard on the map." Knight's husband and assistant Terry Biddlecombe added: "Paul is a good jockey and he knew something was wrong. The only consolation is it was pretty instantaneous and he wouldn't have felt any pain." Owner Jim Lewis said that Best Mate, who was the first horse since Arkle in the 1960s to win the Gold Cup three times, was a pleasure to own and would never be forgotten. "He was a great racehorse - there can have been very few in the world like him," he said. "He helped us raise thousands of pounds for charity and he made a lot of difference to many people's lives." Lewis also confirmed that the horse would be buried at Exeter, where he had won his first chase in 2000 and also been victorious on two other occasions. Jockey Jim Culloty, who partnered the horse in 18 of his 22 races said: "The fact he was as good as he was, as honest as he was, and as consistent as he was, was why the public came to love him and deservedly so. "Having a name like Best Mate helped too and he certainly put me on the map. "I gave up riding a few months ago and my one regret was that I wasn't going to be able to ride Best Mate any more. "I was looking forward to following his career and I thought he had a couple more good years left in him - but it wasn't meant to be."